Worry, anger, stress, perfectionism, body image: if you feel it, we want to talk about it. This is a show for humans of all ages about the difficult emotions we all struggle with. We share research-based solutions for the greater mental wellness of your whole family. You’ll learn tools for improved mindfulness, communication, self-awareness, and we hope you’ll laugh with us along the way. Join hosts Ed Crasnick, a comedian and Emmy Award winning writer, and Renee Jain, positive psychology guru and the founder of GoZen! 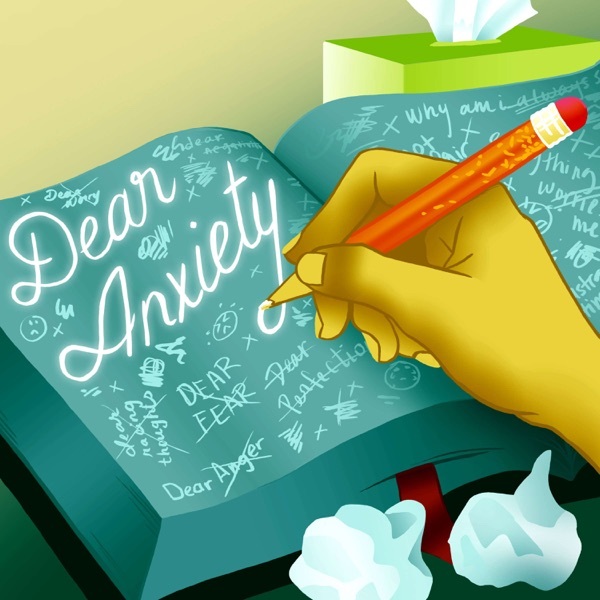 Ed and Renee have the week off, but that doesn't mean Dear Anxiety gets a break. We're happy to share this interview with Dr. Laura Markham. Dr. Markham is a Clinical Psychologist with a PhD from Columbia University, and she’s also a mom who translates proven science into practical solutions for your family. In a conversation pulled from the Resilient Child Summit, she shares strategies for diminishing anxiety, anger, and fear in your child, and in yourself, too. We've all felt it. That volatile sensation that just one more item on the to-do list, or one more job to do, or one more role to play, is going to put us completely over the edge. There's only so much we can handle, and any more will make our heads spin. Overwhelm. Ed and Renee have felt it, too, and in this episode, they show up with some tools for helping us, and our overwhelmed children, get control of our countless responsibilities, and our emotions. Why do mistakes hurt so much? What is it about failing that makes us feel worthless, broken, and afraid to try again? Ed and Renee explain that we come into the world knowing that we learn by experimenting, failing, and repeating, but when we lose sight of what it takes to grow our minds, we become fixed and fearful. Listen in as they describe exercises to actually encourage mistakes, risk-taking, and a growth-mindset. We're obsessed with happiness. Our greetings and wishes for others frequently include the word happy: Happy New Year; Happy Birthday; Happy Friday. Among the founding principles of the United States is the right to pursue happiness. Parents want their kids to grow up happy, and I’m sure that doesn’t sound like a terrible plan to the kids, either. So where do we get some of this happiness, and once we have it, how do we keep it? That's the tricky part. In this episode, we explore happiness, optimism, and positivity, and learn skills for cultivating those very feelings. 92% of teens go online daily. Of those, 52% are online several times per day, and 26% are online almost constantly. Are parents' statistics any better? Not really. Yes, mobile devices certainly have our attention, but why do we spend so much precious time staring at screens? What value do we get from social media and technology? Can we use these tools in more constructive ways? In this episode, we learn that when it comes to technology, sometimes it's not about getting the right answers, but about asking ourselves the right questions. Join Ed and Renee in their conversation about making more mindful use of our devices. Most people know what meditation is: cross your legs uncomfortably; get rid off all your thoughts; enter a trance-like state. Right? Um, no. In this calming episode, Ed and Renee debunk some widespread myths about what meditation is and is not. They describe the real science of the practice, how it affects our bodies and our minds, and how we can easily incorporate it into our daily lives. If that wasn't enough, they guide us through some simple meditations right in the episode, leaving us all in a better, more peaceful place. Rates of diagnosed depression are on the rise for people of all ages, especially teens. How bad is it? According to a report by Blue Cross Blue Shield, in the last six years cases have increased nearly 50% for millennials, and more than 60% for teens. Could anything make those numbers worse? Try imagining the number of cases that go unreported because children, teens, and adults alike feel they have nobody to talk to about their suffering. Ed and Renee have experience battling their own depression, and they’re here to say that even if you haven’t yet found the ability to talk to another person, you can always talk back to the voice of depression itself. Anxiety is debilitating. Worry robs you of happiness. Stress is a killer. I can’t imagine anyone reading this would disagree with those statements, and that’s exactly why we’re so lucky to have Ed and Renee! In this episode, they propose that one of the best ways to manage our anxiety and stress is to, well, change the way we think about our anxiety and stress. Of course, that sounds a little too good to be true. Like, seriously? I’m just going to think something and it’s going to change my life? Yes, that’s the idea, and it’s backed up with real science! It feels like negative thoughts have a living, physical presence. They travel in groups, often gaining speed and momentum, following one after the other. They can surround us, cage us, keep us up at night like obnoxious neighbors. We spend a lot of energy fighting them off, like an infestation of pests. Luckily, Ed and Renee know these feelings well, and they’re here with strategies for … wait a second … allowing them? How can that be right? Listen and find out! If you asked your child if they'd like to do homework right now, or wait until tomorrow, can you predict their answer? What if I said you could skip work today, then make up the time next week? Not one of us is immune to procrastination, even when we're motivated to do something. We know we should go to the gym, but we're sure we'll have more energy later. We need to write that report, but it'll only take a few minutes and we can do that on the bus in the morning. In this episode, Renee and Ed get "sciencey" and tell us why we all procrastinate, why it has nothing to do with being disorganized, and what we can all do to get things done without delay. Your heart is beating out of your chest. The air is gone from your lungs. Your body is rigid and you're sweating through your clothes. The first of your racing thoughts: you're having a heart attack. But that's not it. It's a panic attack, and when it's over, there is relief in the fact that you're okay, that you'll live, but that relief is quickly replaced with more dread. Because... now what? What's wrong with me? What if it happens again? Is there anything I can do to prevent it? In this special episode, Renee shares her personal experience with panic attacks and, together with Ed, discusses the science of these very real, very painful events that affect millions. Wait, why are we discussing our bodies on a show about mental wellness? A person's view of their own body is often tied directly to their self-esteem, and their self-acceptance. Now consider these facts: 53% of 13 year-old American girls are unhappy with their bodies; 50% of teen girls and 30% of teen boys have used unhealthy weight control techniques; 95% of people with eating disorders are between the ages of 12 and 25. Yikes! This is a must-listen episode, in which hosts Ed and Renee address how we all think about our bodies, and how we can improve those thoughts. We've all had those horrible thoughts: I'm not good enough; nobody likes me; I'm so stupid sometimes. That's the harsh voice of self-criticism. It's hard enough to hear it in our own heads, but when we know that voice is in our children's heads, it hurts even more. So how do we fight it? Enter self-compassion! Listen in as Ed and Renee unlock secrets to turning thoughts from foe to best friend. Kids got anger? Forget anger management, let's teach kids to use their anger as a positive catalyst for change. Using research-based strategies, you may just discover that it's easier for our kids to change their habits than it is for us. If that's not enough, you'll learn Ed's "one line" to change your life. Anger is everywhere: on the news, on our roads, in our schools, and in our homes. It’s a stigmatized emotion, one that nobody is proud of, and one we discourage ourselves, and our kids, from feeling. So, why does this podcast begin with positive psychology expert Renee Jain urging us to, “please, feel your anger”? That’s right, in this first of two episodes on anger, Renee and co-host Ed Crasnick wrestle the issue and arrive at some surprising conclusions. Perfectionism isn’t always about getting things right. Often, it’s about avoidance, unhealthy comparisons, negative self-talk, and anxiety over showing up as you really are. If you or your kids experience perfectionistic tendencies including fear of failure, taking risks, and trying new things, this episode is for you. Listen as Ed Crasnick and Renee Jain explore strategies for putting perfectionists on a path toward self-acceptance. Would you believe that having anxiety can actually cause more anxiety? Join hosts Renee and Ed as they discuss worrying about worry. They’ll introduce the mission of the Dear Anxiety podcast, and share tools to help both you and your child through bouts of anxiety.